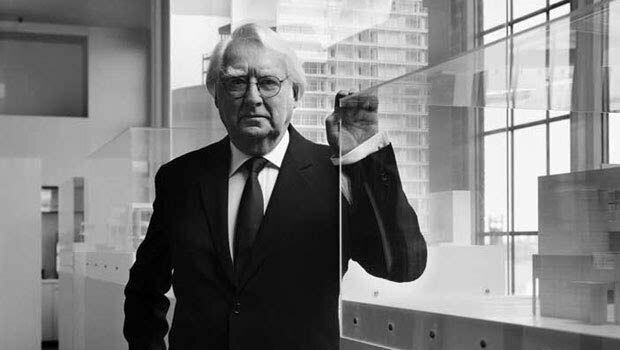 Richard Meier was a leading American Architect, celebrated for his sophistication and elegant designs inspired by classic Modernist principles, and his use of pure geometry, open space, and the artistic play of light. He was the youngest recipient of the highest professional accolade, the Pritzker Architecture Prize, at the age of 49. He was commissioned on some of the 20th century’s most significant architectural projects, such as the Getty Centre and the Los Angeles Art Complex. Richard Meier was born on October 12, 1934, in Newark, New Jersey. He attended the Cornell University, where he graduated with a degree in architecture in 1957. In 1959, he took a trip to Europe in hopes of working for his idol, Le Corbusier, the Swiss-French architect. Meier was able to meet Le Corbusier in Paris, however, Corbusier refused to hire him due to his distrust of Americans. Upon his return to the US, he worked for Skidmore, Owings & Merrill in New York, and soon, he joined Marcel Breuer, and worked there for the next three years. Meanwhile, at night, Meier indulged in his passion of abstract painting. He shared a studio with a friend, Frank Stella, where he worked as an Abstract Expressionist painter. However, eventually Meier gave up his passion for painting to focus on his career as an architect. In 1963, Meier decided to venture out on his own, and he established his own firm. He was commissioned on several projects, and his work on the Smith Houses in Darien, Conn., earned praise for his design of white buildings, inspired by the pristine Modernism of Le Corbusier’s work. During the 60s, Meier formed a society with a group of a young architects, they called themselves the “New York Five”, and proposed a return to the Modernist, rational architecture. Meier’s design for the Douglas House attracted even more attention for its intersecting planes, geometric structuring and white spaces. During the mid-70s, Meier established himself as a notable architect due to his success with a series of remarkable private residences. Now, he began to get commissioned for massive public projects such as the Atheneum in New Harmony; the Museum of Decorative Arts in Frankfurt, Germany; the High Museum of Art in Atlanta; the City Hall and Library in The Hague, Netherlands; and the Museum of Contemporary Art in Barcelona, Spain. These buildings are all renowned for their methodized geometric structuring, their curvaceous railings and staircases, the use of light manipulated to create a glittering effect and the use of pure white in the interior. In 1985, Meier was commissioned to build and design the iconic Getty centre in Los Angeles and for the next 12 years, he devoted his energies towards this project. The Centre consisted of six main buildings to house the Getty collection and the educational facilities, the structure is built with honey-coloured travertine mixed with aluminium panels. The complex offers the dual purpose of public galleries and private study rooms, and its location in the hills of LA, provided Meier an excellent opportunity to experiment with his techniques of manipulating the effects of light. Meier was also commissioned for the design and construction of the Eli and the Edythe Broad Art Centre in Los Angeles.